Create living, breathing worlds from your still image with minimum effort. DP Animation Maker lets you make natural scenes burst with vibrancy and give motion to people and objects. Ever wonder how your friends and colleagues get those neat animations in their photos, slideshows, and videos? Adding lively effects to images is a lot easier than you think. The secret is DP Animation Maker. It's a super simple way to transform any image into a vibrant animation. Sky's the limit! So why settle for boring, static photos or slideshows? 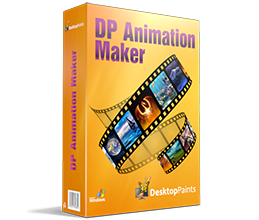 With DP Animation Maker you can bring your images to life by making waves crash at the ocean, snow fall on mountains, and flames flicker on candle wicks. The good news is, you don't have to be a tech guru to use this software. Thanks to our easy-to-understand interface, no special skills are required. Anyone can use it. But tech savvy graphic artists benefit, too. That's because DP Animation Maker takes the guesswork out of the time-consuming programming aspect of the animation process. Artists can concentrate on image design and artwork instead. No matter your level of tech sophistication, our process is painless. Simply open an image, select an effect, add moving objects, export to your preferred format, and voilà — you're ready to share your animation with the world. It's that fast. With the press of a button, you can adjust motion, speed, and other key elements of any moving object. Ready-to-use, animated images are available within minutes. 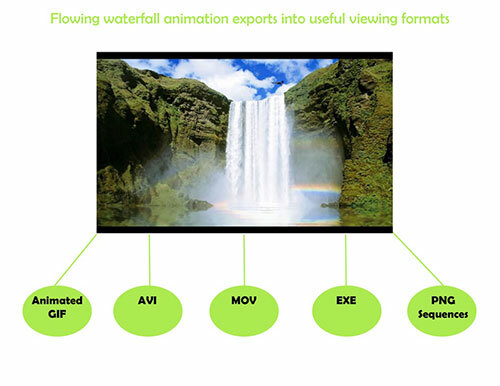 Our prebuilt animations are designed to give you a lot of options. Whether you have a single image or need to create a long slideshow, DP Animation Maker has the rich set of tools you need to put all the pieces together. Once you select your images, it’s easy to go from ‘static’ to ‘alive’ with our wide range of effects, stationary objects, moving objects, brushes, music, timing, and camera adjustment features. You can also import your own animated GIF files if you want to add more effects to them as well. Give images the appearance of being underwater, of having a reflection, or of being on fire. After you select a desired effect, you can fine-tune the height of your flames or the speed of your waves by tweaking the adjustment settings. DP Animation Maker gives you more than 60 objects to choose from in our standard pack, and over 200 in extension packs. Add new elements into your image such as snow, rain, fog, and lightning bolts. Then, make them pop with sparkles or rays of light. 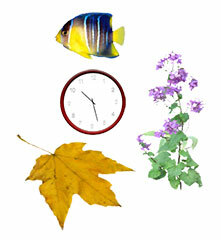 Integrate other natural elements such as grasses, falling leaves, flowers, butterflies, birds, and fish. Or insert bubbles, ghosts, clocks, explosions, electricity, and magic dusts for a fairy tale feel. You can also make a statement by overlaying text to convey a written message. Then, get ready to customize. Depending on the object you insert, you’ll be able to select quantities, size, speed, color, translucency, blending modes, angle direction and rotation, horizontal and vertical properties, motion boundaries, delays, and pauses. Add even more variety to your creations with our powerful set of animation brushes. Use nature brushes to insert fire, streams, water, or blinking lights. Intensify object movements with geometric brushes that give you waves, drifts, zooms, and rotation. Or go with pattern brushes that provide pink and colored hearts, glittering and gold stars, and other custom patterns. Here’s a detailed look at some of the most popular ones. Fire Brush — Make dangerous sparks shoot from a dragon's mouth or light up a fireplace with glowing flames. Stream Brush — Put waves and splashes in waterfalls, fountains, and running springs. Water Brush — Add ripples to lakes, rivers, and oceans. Wave Brush — Make a character's hair blow in the wind or show clothes rustling in blustery outdoor environments. Radial Wave Brush — Insert a 'rolling' feel in abstract works, waves, and water-filled areas. Blinking Light Brush — Give cars, neon lights, fires, candles, and other lit objects the appearance of change by alternating between dim and bright settings. 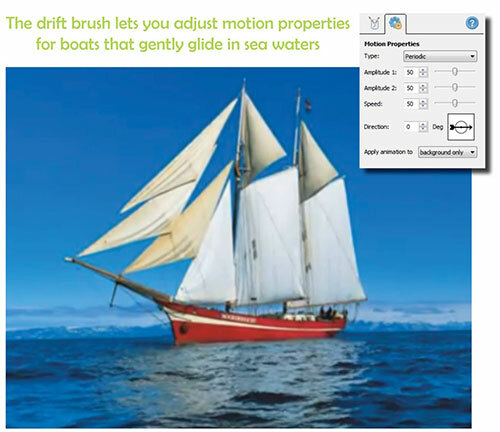 Drift Brush — Let boats and rafts gently rock on river surfaces, or place ships in gentle sea waters. Zoom Brush — Show characters breathing by adding chest-movements and pulse sensations. Rotation Brush — Give your galaxies, planets, space objects, and wheels ongoing rotation to keep them spinning. Background Copy Brush — Use any background as an outline or pattern for other effects. Glitter Brushes — Spread sparkle and light with bright glitter patterns. Perfecting your animation is easy. Our drawing tools allow you to use small or large brushes, erase your work, determine size, and define hardness and opacity percentages. Adjustable property settings also enable you to designate movement speed, stretch and shrink percentages, and apply animation to specific parts of an image. Have the perfect song you want to include, too? You can. Our music upload feature lets you integrate MP3 audio files that will play during your movie. Simply choose songs and put them in your preferred playing order. You can preview your animation by adjusting the scene zoom and camera speed before you export your work. With DP Animation Maker, you can add and delete effects as frequently as you wish. It’s a helpful way to experiment and be creative so you can get the look you want. When you’re ready to publish, DP Animation Maker exports your animation into several popular formats. This highly compressed format is great for the times you need smaller files sizes, such as when you’re creating web banners. Ideal for playing videos on Apple’s QuickTime, MOV files are widely-used. They offer non-professionals a straightforward way to create ready-to-watch movies while giving professional filmmakers a tool that’s lossless and supports alpha channels. If you want your animation as individual frames that you can put into other types of software, such as a video editor, PNG sequences provide an easy way to do so. Not sure what kind of video player your audience has? No problem. When you export your animation as an EXE, it will play on any computer. There’s no need for a specific player (e.g. QuickTime) or plugins. With each format type, you can adjust the settings. Select image width and height, animation duration, frames per second, and compression to fit your needs. Can you find other software out there to do your animation work? Of course. But professional editions of software like Adobe Flash, Adobe Photoshop, or Autodesk 3ds Max can set you back hundreds or thousands of dollars. Not DP Animation Maker. Our software has an affordable price that everyone can afford. And unlike some other animation software companies, we issue updates regularly. Almost every month users get minor updates that add several new features. With a 14-day money-back guarantee, ongoing program updates, tutorials, and immediate download and CD options, there’s no reason not to try us out. When you do, you’ll see for yourself why customers all over the globe are choosing DP Animation Maker to save time and money when it comes to animating images and turning them into videos. So get started now. In just five minutes, you could be on your way to creating high-quality animations, just like the pros.